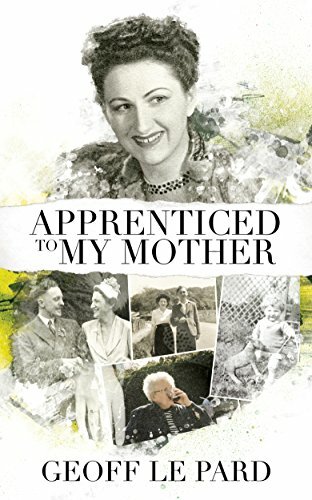 This entry was posted in Daily Life and tagged Apprenticed to My Mother, book review, Geoff Le Pard by thecontentedcrafter. Bookmark the permalink. Just bought the book, too! Can’t wait to read it. I’m sure you will be mightily entertained there Pam – Have fun! While I’ve not read this book (or Geoff’s blog), I’ve read books that have captivated me to the point that I have read all day and all night. Your description of the anticipation, the process of reading, and the stopping to deal with life’s demands before returning to the book are on point. Perhaps I’ll add this to my list. I think the one I have is the short story collection. Can’t wait to choke on my coffee. Lol. I come with a health warning…..
Oh, it sounds wonderful, Pauline. What a good review you’ve written! The cover looks so interesting, too. Thanks for sharing about another good book I need to read. Great cover and great review!!! Pauline is a superhero for sure and if you do get it and enjoy it, well my work is done! Cheers to a good story – especially a personal one. I laughed, I cried, and I really enjoyed this book so much. It is a fast read, you won’t want to put it down. Geoff is the kind of son any Mother would be proud to have. After reading I have the utmost respect and admiration for his mother Barbara. I think his family is delightful and he writes about his Mother, his Father, his family with such love. I finished the book yesterday. My review on Amazon was the first review. I don’t think you can see it unless you are in America. Here you can only get the Kindle version, so I’m grateful I found it at all! Thank You Pauline! Geoff maybe you can help me buy a few for friends? Oh, thank you very much – no-one has ever said they like my name before! I’m not even particularly fond of it! I think it is wonderful that you have such warm memories to accompany the name – it makes a real difference doesn’t it. When I was in Italy I was called Paolina which I loved! You didn’t say, but I hope you enjoyed the book. Geoff will be pleased, I’ll try and remember to remind him to pop over again and help you out – I’m sure he will be happy to! Hi Eliz. I’m not sure what I haven’t done yet to make paperbacks available in your neck of the woods, but if you email me at glepard@saqnet.co.uk then I’m sure we can sort something out. I’m so glad you introduced us to this memoir, and to this writer. Like you, I had to devour it as quickly as possible, and it certainly didn’t give me indigestion. Wow – that was quick Yvonne! I’m glad to hear you came out unscathed! What a tantalising review – I rarely have time to read but this sounds like a must! You are way too busy to add reading onto your to-do list – but if you decide to settle in with a book that makes uplifting and pleasing reading this is a good one! I’d be delighted if you get the chance. My copy is on my iPad waiting patiently to be read. As you did, I have read snippets on Geoff’s blog and am looking forward to reading it all together. He must be mightily chuffed with your glowing review. If I hadn’t already decided to read it, you would have convinced me I should. I do hope you enjoy it too Norah! I love it when you find a book that captivates you so much that you hate for it to end. Glad you enjoyed this book, and now with that kind of recommendation, I may have to check it out. oh go on, you now you want to!! Thanks for thinking about it, anyway!! I think I felt like I knew all the characters quite well and his mother really appeals to me – I love the way she handled life. It is also a lovely for a change to read a book where there is no heros and anti-heroes. No angst, no suffering – just an ordinary life told with respect and humour and loads of love. What a wonderful review. It’s so nice when you come across a book that you really can get into and love. Will have to check this out. I read it in a couple of days – it was an easy read! And of course I loved it. I bought all of Geoff’s other books after your recommendation Pauline. I’m off to check out this one now! Goodness. All?! I hope you find something you like, though this has been a pleasure to produce so maybe it is as Pauline has it the best of the bunch. I find it hard to decide. I’ve read a couple and thoroughly enjoyed them. That’s fabulous if you ever had a moment to post a review on Amazon… Too cheeky? Will do when I’m home again! I’ve read a couple and they were great. No reading at the moment, too much to see and do. A wonderful review. It’s so exciting when you come across a book which is a page turner and really captivates you. Thank you Ms G. Nice to see you again. I am just surfacing from a 3 week holiday followed by 10 days of a wretched cold. Your review is compelling, Pauline! You don’t just tell us that you love the book but give us reasons why so we can know that, if we love the same things you do, we’ll enjoy the book as well. Blimey, how much do I owe you? That’s some review. Can I copy and paste it into a boastful little post. Maybe get it tattooed somewhere? Truly I am stunned. It’s very rare a book can keep me reading for so long – without falling asleep that is – but, when it happens, it’s a real treat. Heh, heh!! Good to know! My reading impulse has been quite low of late – usually just a half hour or so when I tuck myself into bed – but this was devoured very quickly while everything else waited. I love that feeling of not being able to put a book down. It’s like a good conversation. Thanks for letting us all know about this! Glad your winter is proceeding with some good reads. No, but I’ve had dinner with a friend, and been much more to the garden, which is yielding lovely things this year. Let’s talk soon! I’m off 7/22-30, so I’ll suggest time! Lovely! Just let me know what suits and I’ll be there! Thanks a lot for your viewpoint Pauline.I value your words. I could only get the Kindle which I hate. But after reading your review it will be well worth it! I have many children. (birth/adopted) 10 are boys. A mother son relationship is very complicated. Especially as mothers change and grow. My youngest birth son is 14, We are very close. I had him at 47. Altho I may not live long enough to get old with him, I can imagine! ’10 are boys’ !! That is a lot of children – and you didn’t reveal the number of girls. I am terribly impressed and awed really. I was a teacher for many years and have weathered many class camps with numbers between 25 – 28 and was always exhausted at the end 🙂 Now your memoir would be really interesting – thanks so much for coming by! A teacher! Wonderful! I homeschool. I buy curriculum workbooks for the kids without special needs, and write teaching plans for the 5 special needs. I’ve been lurking here ;o) Found you at Nanna Cathy’s. I’m on chapter 5 of the book! Absolutely delightful! Very well written! Off to read more! Isn’t that the best feeling ever? I love finding a book that captures my attention. I especially like books with a strong feminine presence. I will check out Geoff’s blog. Hi Cheryl. I hope you enjoy whatever you find. Pauline is great, isn’t she? I just had it delivered to my tablet. It’s the easiest way for me to read and I love memoir. I don’t have enough reading time for all that I want but his will go to the top of the list. I love to stop by his blog but for me, something gets lost in translation. I don’t always understand the colloquial expressions the British use so a lot gets lost. I’m too embarrassed to ask what a sentence means. It’s English, for goodness sake. How can I not understand it? If I get stuck, I send you a note and you can translate for me. Thanks for sharing how much you liked it. I am bilingual in English and American Marlene – and I never thought that was an adjective that could be used by me 🙂 Often it’s the humour too – they are two very different things! I’d love to translate if you ever get stuck and I’d love to hear what you think of it too. I’ll start reading tonight. 🙂 Thank you and it is slightly humorous to be bilingual in English and American. 😉 Thanks. Hi Marlene. My family don’t understand me half the time so please, if it’s not clear then you won’t be the only one wondering what on Earth I’m saying. Do please ask, Ill be delighted to explain. Though sometimes the explanations are worse… but hey, that’s just an excuse to keep corresponding. Oh and Kiwi English is as impenetrable as British English. It’s the lack of indigenous mammals, I believe. You do always make me laugh. I have family in Australia so I do know what you mean. After emigrating from Germany, it was hard to understand anything they said. My poor mother never understood American jokes. It’s the colloquial expressions. I’ve finished chapter one last night. I’ll keep you posted. Sounds like a must-read story. It’s certainly a different perspective from the usual Rosaliene – a lovely change, a breath of fresh air in our world of troubles! I just signed up to follow your blog so that I can keep in touch. Wow – that’s quite a recommendation. I love a book I can’t put down. I just looked him up – TanGental – I know him from comments I’ve read. Thank you, Pauline. I hope you enjoy whatever you find there Jodie. Well, let’s see if my local library network has this. It sounds very inviting. Thanks Yvonne, it’s a lovely gentle read! Hi Yvonne. I’m not sure if libraries will stock it but if you wanted a copy I’d be happy to get one to you. Just use the contact button on my blog header and we can sort that out. Thank you, it’s downloading onto my Kindle as I type. See ya, I am off to do some reading.